Always treat people as ends in themselves, never as means to an end. He who is cruel to animals becomes hard also in his dealins with men. We can judge the heart of a man by his treatment of animals. Although now uniformly recognized as one of the greatest works in the history of philosophy this Critique was largely ignored upon its initial publication. Judgments are for Kant the preconditions of any thought. However that it is analytic can be disproved thus: if the numbers five and seven in the calculation 5 + 7 = 12 are examined there is nothing to be found in them by which the number 12 can be inferred. These included the Critique of Practical Reason (Kritik der praktischen Vernunft 1788) the Metaphysics of Morals (Die Metaphysik der Sitten 1797) which dealt with ethics and the Critique of Judgment (Kritik der Urteilskraft 1790) which looks at aesthetics and teleology. 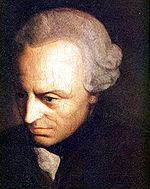 Immanuel Kant (German: [ɪˈmaːnu̯eːl kant]; 22 April 1724 – 12 February 1804) was a German philosopher. The mind shapes that experience and among other things Kant believed the concepts of space and time were programmed into the human brain as was the notion of cause and effect.